For something you can have in 1 day? 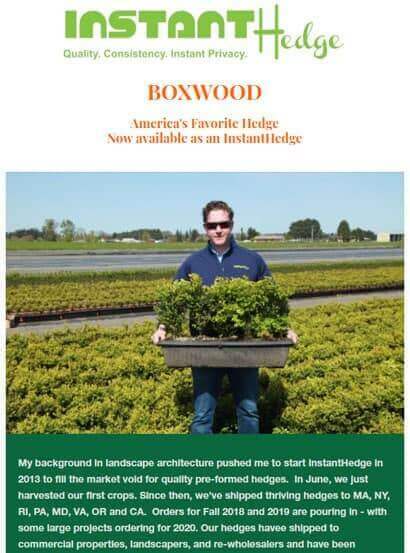 InstantHedge units are ready-made in 3 convenient sizes to fit the needs of any landscape project; 5-6’ tall Garden hedges provide instant privacy and screening, 3-4’ tall hedges can be used to create garden rooms and medium-sized borders, and 18” tall boxwood hedges are perfect for knot gardens and low borders. 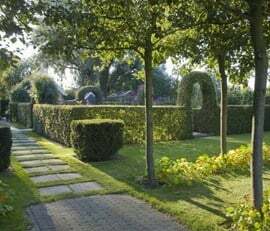 InstantHedges can easily be maintained at these sizes with regular pruning, or they can be allowed to grow much larger over time. 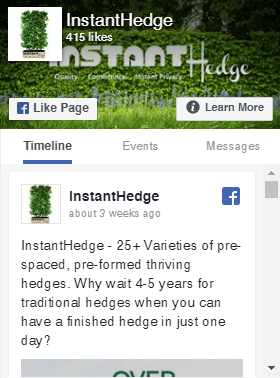 All InstantHedges come in “hedge units”. 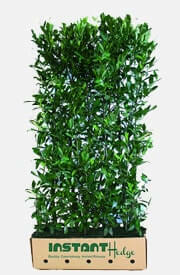 18” height hedges are 32” long and 10” thick with 5 plants per unit. 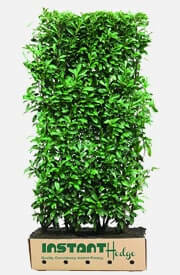 3-4’ and 5-6’ height hedges are 40” long and 16 inches thick with 4 plants per unit. 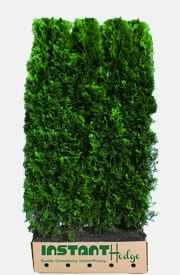 There is a huge assortment of best hedges for garden in production at our nursery. 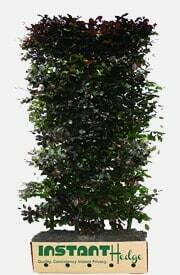 We have evergreen hedges, deciduous hedges, fast-growing hedges (Cherry Laurels and Green Giant Arborvitae), slow-growing hedges (Emerald Green Arborvitae), green hedges, blue hedges (Wichita Blue Juniper), purple hedges (Purple Beech), flowering hedges (Royal Star Magnolia), hedges with beautiful fall colors (Flame Amur Maple), thorny hedges for security (Teton Firethorn), deer-resistant hedges (Boxwood, Western Red Cedar, and laurels), bird-friendly hedges (Cornus mas), extremely cold-hardy hedges (Arrowwood Viburnum, American Arborvitae, Amur Maple), salt/heat/drought tolerant hedges (Portuguese Laurel), hedges for wet areas (Bald Cypress), and more. 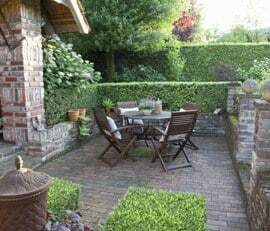 Our most popular hedges are European Beech hedge (Fagus sylvatica), English laurel (Prunus laurocerasus), Schip/Skip laurel (Prunus laurocerasus ‘Schipkaensis’), Portuguese laurel (Prunus lusitanica), American Arborvitae (Thuja occidentalis), Green Giant Arborvitae (Thuja x ‘Green Giant’), and Green Mountain Boxwood (Buxus x ‘Green Mountain’). 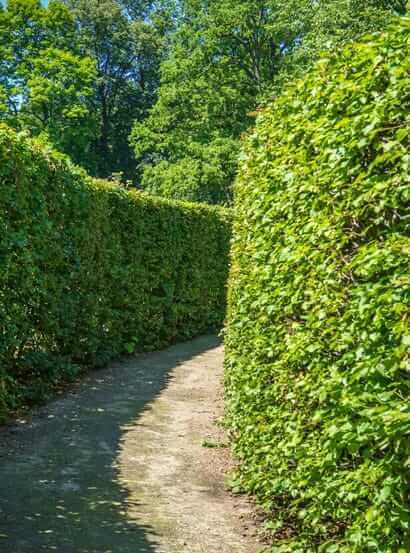 Each variety we grow has been carefully chosen, and there are some common garden hedge types that we have elected not to grow due to disease or maintenance issues. 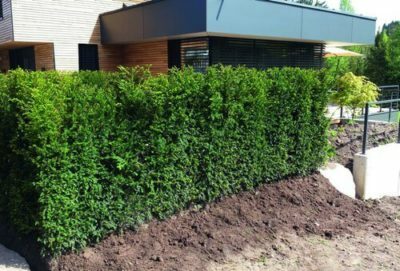 It is extremely important to us that our hedges are successful for you not just immediately after installation but for years to come. 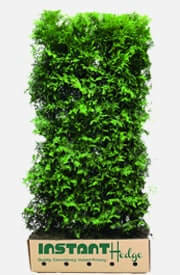 Our Biodegradable Cardboard Boxes are perfect for projects that will be installed within several weeks after delivery. 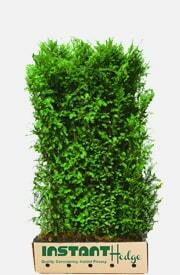 You can plant the hedges in the boxes and the cardboard will degrade within 45 days. 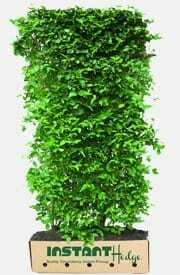 The hedge’s roots will grow right through them, and you won’t have to worry about disposing of hundreds of nursery containers. 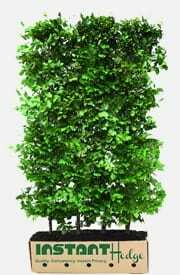 These are a highly environmentally-friendly option. 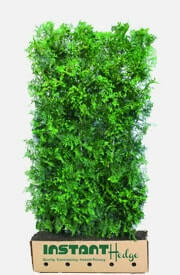 Our Woven Fabric Bags are a great solution for projects that are being installed in stages. 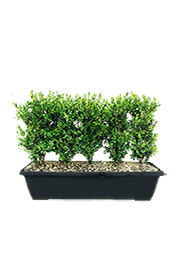 They are also useful for stocking hedges at sites without forklifts as they have 4 handles on each bag and can easily be moved around with two people. 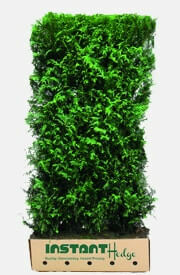 Another benefit is that we can ship one more hedge unit per pallet, saving you on freight! 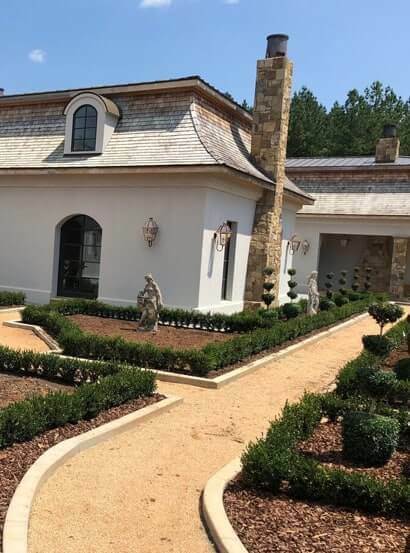 Our Cedar Boxes are custom-made to fit our hedges perfectly. They are durable, beautiful, and customizable. 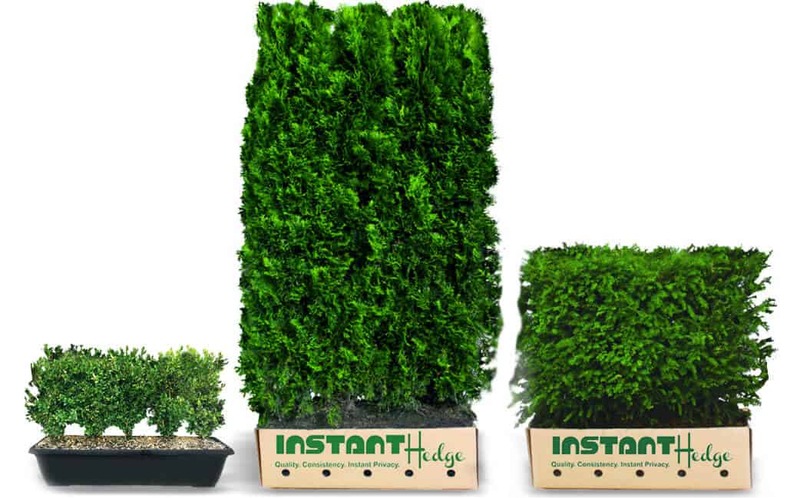 They are ideal for displaying samples of our hedges in garden centers or sales yards, and they can also be placed straight onto a patio or balcony for instant privacy. They can be easily moved with a forklift. They are available with or without our logo on the sides and can be painted any color. 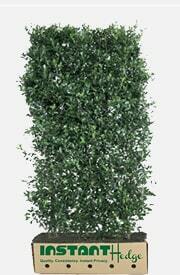 Our 18” garden hedges come in a custom plastic container that makes a wonderful display and is easy to move around. 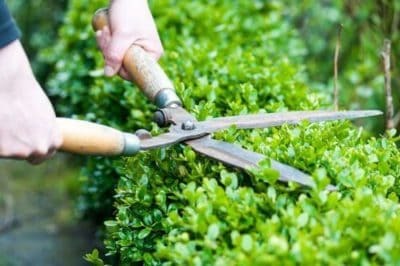 The InstantHedge process involves extensive root-pruning of all our field-grown hedges. 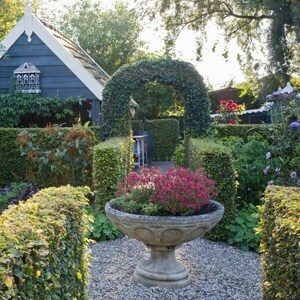 Each crop is root-pruned five times before harvesting, resulting in a dense, healthy root mass near the base of the hedge. 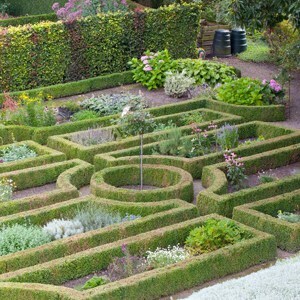 This also means that when the mature hedges are harvested, no large roots are being cut. 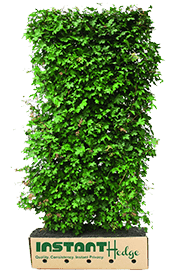 This minimizes the stress on the hedge at harvest, which means little to no transplant shock. 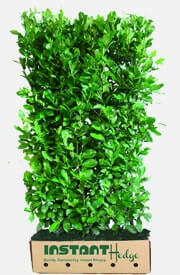 It also enables us to harvest and ship our garden hedges at any time of year. 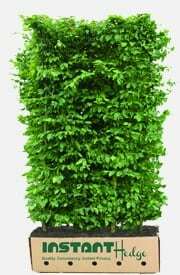 Different hedge varieties we grow. 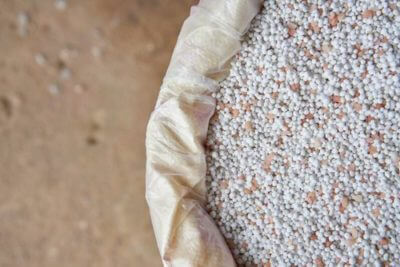 Download our latest Catalog and get to know our process and varieties. 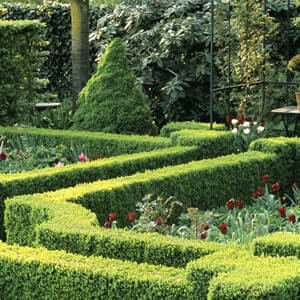 Which type of hedges do you need?